Having been in the hobby for many years, I am always on the lookout for something unusual. Mudskippers are surely a fish that fit the description. While most fish are content to live their lives fully immersed in water, mudskippers (fishes of the genera Periophthalmus, Periophthalmodon, Boleophthalmus, Scartelao, and Zappa, of which the first two are commonly seen in the hobby) not only live IN water, but unlike most fish, mudskippers spend much of their life OUT of water! In nature, at high tide, you can find them at the water's surface, resting on rocks, roots or anything else they can find to perch on, usually within reach of their burrow. At low tide, mudskippers can be seen walking (yes, walking!) on mudflats, actively foraging for food. But how do mudskippers, which are fish, walk on dry land? By using their highly modified pectoral (swimming) fins much like legs. And by flipping their bodies, they can "skip" across the mud (and water), which is a great way to avoid predators. They are poor swimmers, and will also use these fins to walk underwater (mudskippers move faster ABOVE water than BELOW it!). Another unusual aspect of mudskippers is that they are one of the few fishes that can actually drown if held underwater. They need to be able to poke their heads above the water's surface and gulp air. Mudskippers retain water in their large gill chamber that closes tightly when the fish is above water. This keeps the gills moist, and allows them to function. You will often see them rotate their eyes to mix the water in the gill chamber and keep the gills from sticking together while at the same time supplying them with oxygen. Yet another amazing fact about mudskippers is that they can actually breathe the same air that we do. They absorb oxygen though blood-rich membranes found at the back of the throat. They can also absorb air through the capillary-rich skin providing the skin remains wet. Mudskippers: A Fish Out of Water and Walking! 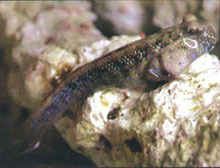 Mudskippers, usually Periophthalmus barbarus, the Atlantic mudskipper, are sometimes seen offered for sale in aquarium shops. However, as their needs are vastly different from those of other fishes their lifespan can be, unfortunately, short. It behooves both the shopkeeper who sells them and the customer who would buy them to learn about the special needs of this most unusual fish. For example, mudskippers require a fairly large tank as most species get large (about 11" for the Giant mudskipper Periophthalmodon schlosseri). A 50 gallon tank (36" x 18" ) is ideal to house a trio of 'skippers that large ('skippers can be territorial, and should not be crowded. One male to two females is advised). For those hobbyists without a lot of room, there are the smaller species of mudskippers, of which Pearse's mudskipper, Periophthalmus novemradiatus, is the most commonly imported. Reaching about 4" in length, a group of 4-6 can be housed in a 20 gallon long (30" x 12") tank. The tank should be filled half way with brackish water (brackish water is a mix of seawater and freshwater). Usually one part seawater to two parts freshwater is fine for them (using a synthetic sea salt mix, use one third the advised amount per gallon of water). Would-be mudskipper owners also need a good filter (a canister filter is advised) as well as a tight fitting cover (being able to walk makes 'skippers GREAT escape artists!). Fine oolitic aragonite sand is perfect as a substrate as it buffers the water and provides a smooth bottom for the fish to walk on. Driftwood, rockwork, etc., some of which should be sticking above the water's surface, should then be added. One of the most endearing traits of these unusual fish are their great personalities; in time, they will learn to take food from your hands! Foods such as frozen bloodworms, frozen krill, pellets, and even small pieces of fish and clam, are readily eaten. They have voracious appetites, so feeding them two or three times a day is advised. As to tankmates, providing your aquarium is large enough you can add species such as the four-eyed fish (Anableps anableps), finger fish (Monodactylus sp. ), and freshwater pipefish (Doryichthys boaja). So, if you are looking for an unusual fish to keep, think of the realm betwixt land and sea, and there you will find the mudskipper!